The 9Solutions solar powered Real Time Location Sensor (RTLS) is a wireless indoor tracking system that uses indoor light and GCell to become self-powering. GCell is integrated into the worldâ€™s first self-powering wireless real time tracking solution for Finish hi-tech company 9Solutions. The IPCS Zeroâ„¢ Real Time Location Sensor (RTLS) offers asset tracking and position capabilities to hospitals and care homes with the benefits of fast and non-obstructive installation. Having successfully made a prototype in early January 2013 for demonstration at the Consumer Electronics Show 2013, 9Solutions successfully gained a contract with Eclipse Nursecall Systems Ltd for the supply of a RTLS solution for installation into a UK based hospital. Our technical team worked tirelessly with 9Solutions to fully understand the requirements for their initial order and to ensure all parties was able to meet the strict deadlines. Our familiarity with Texas Instruments bq25504 energy harvesting IC ensured compatibility with the specified GCell solar module. Our Business Development team was in regular contact with 9Solutions throughout the development, manufacture, delivery and end product assembly processes to ensure customer satisfaction and end-user satisfaction was achieved. We delivered a shipment of GCell module to 9Solutions on-time-in-full for assembly into the IPCS Zeroâ„¢ product. GCell has enabled 9Solution to offer hospitals and care homes a RTLS system with easy installation, minimal maintenance and is environmentally friendly. Combining BluetoothÂ® and GCell to create the enviable proposition of a self-powering wireless RTLS solution. Wireless plug â€™n play system shortens locating system deployment time from months to days and quicker payback for the customer. The robust nature of GCell brings negates concerns with damage during transportation, mishandling during installation and impact damage associated with heavily trafficked areas. GCell enables 9solutionsÂ IPCS Zeroâ„¢ to offer 10 years of maintenance free operating time without an external power source. 9Solutions is an international hi-tech company having HQ in Oulu, Finland and sales offices in Helsinki, DÃ¼sseldorf and London. 9Solutions develops, manufactures real time locating solutions based on BluetoothÂ® and cloud technologies. 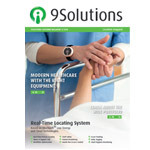 9Solutions offers advanced safety- and asset management solutions to Hospitals, Nursing Homes and Schools.